The sun was just about visible over the horizon, Dartmoor. 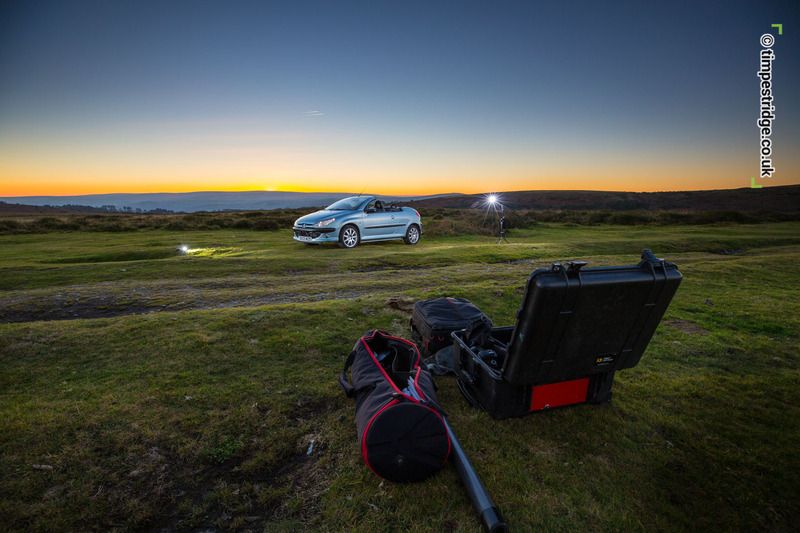 Shooting into sun meant adding lights to fill dark shadows on car. This is the scene so you can see my lights giving the fill light. At this point, sun's down. Still just enough light to shoot. Only a minute or so before sundown! At this point you're almost out of time. Shooting with a wide angle close up distorts the car's front like this. 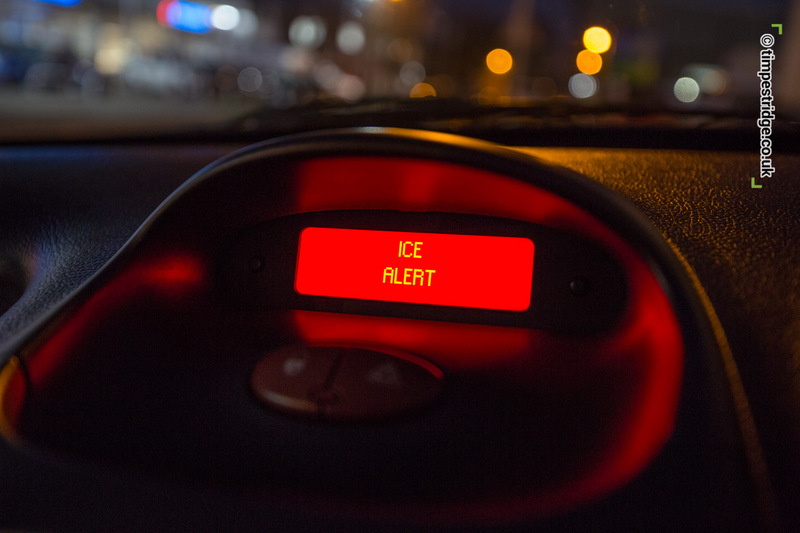 With temperature down to 2 degrees the ice warning came on. I dared myself to keep the top down for the half hour home. Glad I had a hat! 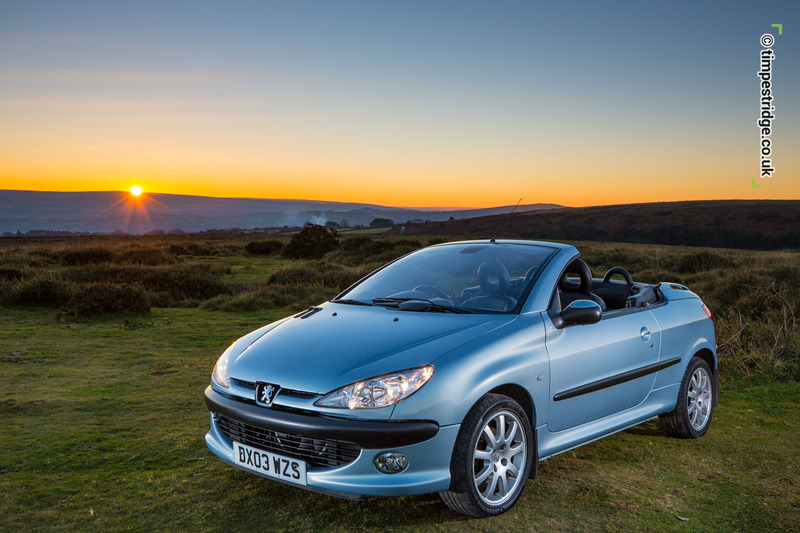 Peugeot's little 206 CC launched in Jan 2001 and became the best selling convertible in the UK for three years in a row. It did gather a reputation as being more of a ladies car. I had never given them a second look, certainly not in baby blue. But Gumtree threw this 2 litre version up at a temptingly low price under a mile away from my home. No, I didn't need a new car. But the 206 CC turned out to be genuine fun. And it's lowly price tag was due to the car having lost some paint after vinyl sign written letters were removed. Probably saying 'Deb's Doggie Wash' or 'Bev's Salon'. 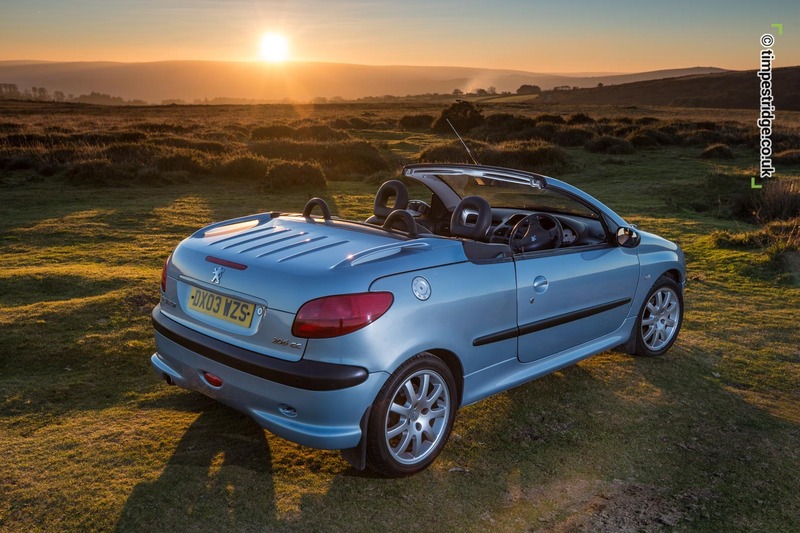 So, here I am with my bangernomics bargain buy, top down, on Dartmoor, with the weather outside a brisk 2°C. And I have to admit to feeling rather smug, and more than a little toasty with the heater set to 28°C. As you can see I set up my lights (on the way home from a commercial property photo shoot), and had some fun photographing it as the sun set. Trying to convince myself of the car's masculine side isn't easy, but I'll have a go. It's 2 litre engine is the same as the 206 GTI, blessing the car with a sub 9 second 0-60mph time. And the engine is very flexible, easy to potter around Devon with, but with a harder frenetic recycling edge when hustled. I was impressed with it's willingness accelerating through the 50-80mph zone. And I reckon it handles well, in a go-kart kind of way. 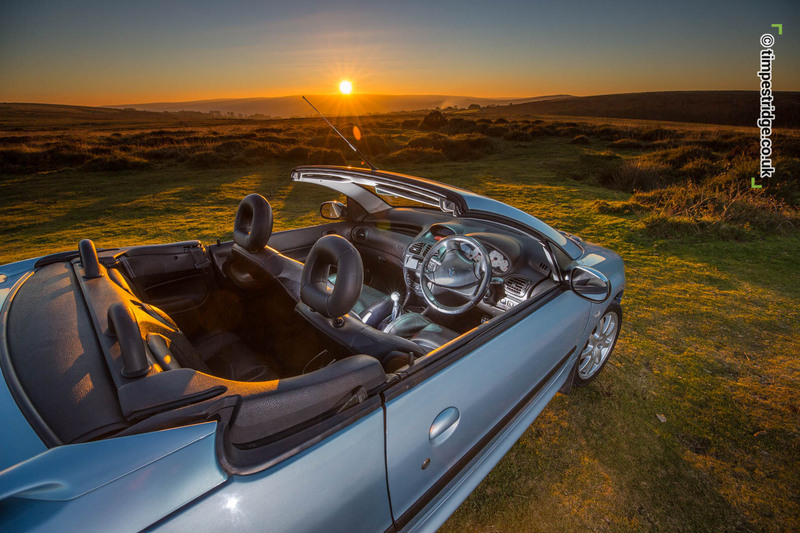 Surely the car's greatest asset in the face of our UK weather is it's hardtop electric folding roof - something anyone with a normal vinyl soft top would dearly love. Security is probably on par with a normal tin top car, and both sound levels and temperature control are far superior to a standard soft top. And it's pretty much a one button affair. Do you know, I've really come to like this accidental purchase. Sure, I've faced some stiff criticism from friends, who've found the cars image a little out of step with their expectations. It's a hairdresser car. I realise that. But for the same price as a games console I've got a Peugeot 2 litre GTI engine, an electric convertible hardtop, 2 occasionally useful rear seats (MX5 can't do that), black leather, air conditioning, sills that are rust free (MX5 owners will look at floor at this point) and a fresh MOT this week without a single advisory. One point of shame is the gear change, which using an analogy I once heard in relation to a Fiat Uno, 'changing gear in this car is not dissimilar to stirring a long spanner upright in a bucket.' It's awful. But like anything in a car, you get used to it. Furthest drive has been to Dorset for a photo shoot in Weymouth. 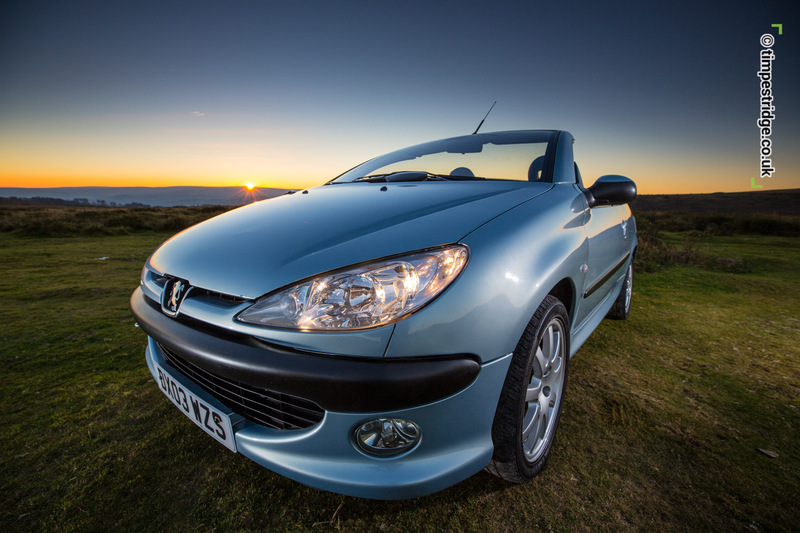 My client nearly dropped his coffee when I told him I planned to drive from Exeter in a 206 CC! I've swapped the 206 badge for a 2.0 litre badge in a vain attempt to reassure other drivers that I'm serious about driving. Hilarious really. Vanity. Bottom line, it's a perfectly good car. And there's masses of them for sale for under £900, for anyone brave enough. 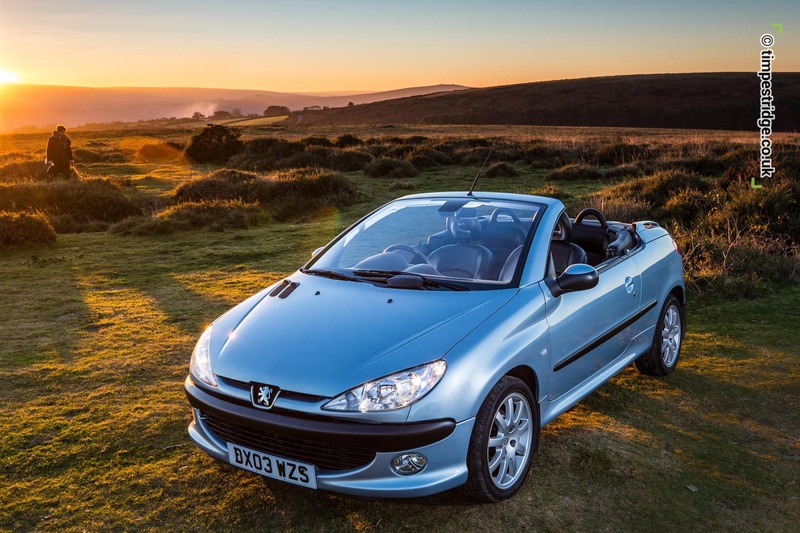 I began to feel I'd got to the end of the road with 'Project Peugeot' - we were destined to only be temporary partners, and in truth I tired of having to explain how cheap the car was to justify the purchase and it's image. In it's place, a Mk2 MX5.